Hubble Telescope has discovered a planet-eating star. 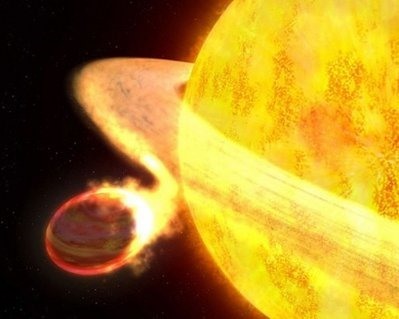 According to NASA, the star is currently consuming the planet Wasp-12b. But don't worry about missing this phenemona. Scientists say the star could take 10 million years to swallow! "Wasp-12 is a dwarf star located approximately 600 light-years away in the constellation Auriga. The exoplanet was first discovered by the UK's Wide Area Search for Planets (Wasp) in 2008." Self-immolation + cannibalism simultaniety'll get you every time.